How quickly things change. Just a few short weeks ago I was receiving emails of concern from family and friends about our safety as the North Korean threat dominated the US media. Then the Boston Marathon attack happened and Korea all but vanished from the airwaves. My beloved city of Boston became the place to worry about. When North Korea was threatening South Korea, Richard Engel, from NBC was reporting from Seoul every night. One of my friends here said to me, “When Richard Engel is in your neighborhood, it’s time to get out.” Well, he left Seoul and last I knew, he was reporting from Boylston St. in Boston. 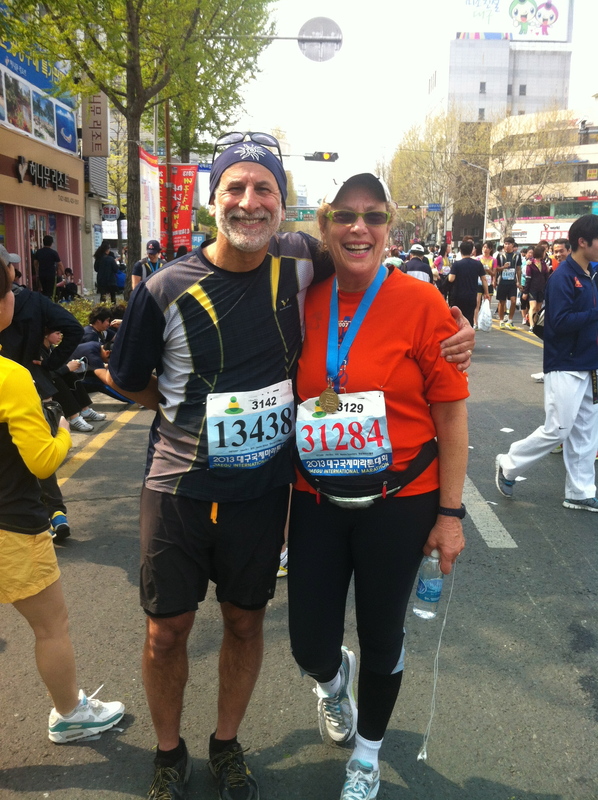 The day before the Boston Marathon, I ran a 10K here in Korea and thoughts of Boston crossed my mind. I usually made the trip to Boston to cheer on the finishers. I was a spectator until 1999—when I ran that amazing marathon—and have been a cheering spectator since, whenever I’m in the area. I grew up in Boston and I know first hand how tough the people of Boston are. Next year’s marathon will be full to capacity. My medal from the 101st Boston Marathon has a new sense of pride for me. There were about 2000 people in the 10K race I ran. If I were in any race in the States no one would even notice me. In addition to standing out as a tall, blond foreigner, I was, likely, the only woman over 50, let alone 60. Lots of people were staring at me as we lined up to start. I’ve gotten used to that. Sometimes I feel like a celebrity, which can quickly turn into a sideshow with people wanting to be photographed with the crazy, blond, foreigner. As the race started and we were off, me at my slow and steady pace, runners passed me giving me a thumbs up. Again, at first, I paid little attention thinking it was about my foreign “celebrity” status but it never stopped with the spectators joining in—it seemed that every person I passed on the sidelines and throughout the race gave me a thumbs up with a look of incredulity about the fact that I was running the race. It was then that I realized that my age is no longer a secret. I’m not young anymore and I don’t blend. Certainly not in a road race in Korea! My life here continues to be wonderful and adventurous. This past weekend Steve and I headed to Seoul for a night. We took the 2-hour high-speed train and when we exited the train station and went into the subway station, the crowds startled me. It was like going from Portland, Maine to New York City. Crowds of people, the hustle and bustle of a city of over 10 million people astounded me. We live in a university town of 240,000 on the outskirts of Daegu, a city of 2.5 million, not exactly small, but everything is relative. I was glad to get “home” on Sunday and that is was a good feeling. I’ve noticed how small things can bring enormous joy. When I arrived in February Steve had been living without a shower curtain. Very Korean! Every bathroom has a drain on the floor for the water from the shower. This causes water to be on the floor for a while after showering and it began to drive me crazy. Everything was wet. I bought a new shower curtain, went western and feel so happy. Steve was very accommodating. Small things bring big joys. I also asked my friend Jill to send me a set of sheets. For some reason sheets here are both expensive and poorly made, not a good combination for anything. I asked her to put a few cans of anchovies in the box, something I can’t seem to get here, which is weird since so many dishes have anchovies in them. They’re fresh not canned. The box arrived and the sheets are amazing. The anchovies tasted so good in the Caesar salad I made the night the box arrived. Small things that I take for granted bring big joys. I’m in the middle of midterms. For a person who taught for 12 years at Antioch, a graduate school with no grades and no exams, this is all new to me. The test has two parts, a listening and written part and a speaking portion. The first part consists of listening to dialogues in English and answering questions, along with reading passages and answering questions and writing a complete paragraph. That’s all pretty standard. That was last week. This week is the speaking test where two students come together and meet with me for 10 minutes and have a conversation in English. Tuesday, I did this 24 times, back to back, over a 4-hour period. Oh MY GOD and I have to repeat it again tomorrow with another 24 pairs! The students can talk about whatever they want and they have a set of random questions I give them to help them along. The partners have been together since the beginning of the semester so they have familiarity with each other. I simply sit, listen and tell them when the time is up. I had two young women who sang their favorite songs to each other in English. I discovered which pairs had budding romances and witnessed lots of flirtations. By the time we got to the fourth hour, I wanted to stick a poker in my eye. One of my students said to me, “Teacher, are you alright, you look very tired.” I wanted to say, “You try listening to nearly 50 students talk for 10 minutes in mostly grammatically incorrect English and see how you feel.” I gave them credit for trying and keeping a conversation going. I began to hear myself in their conversations, paraphrasing what each other was saying. I have been telling them that repeating back what someone says in English helps you process what the person is saying and gives you time to think about a response. I guess they got it. There was a lot of, “So you’re asking me what my favorite song is?” Response: “Yes, what is your favorite song?” I may be forced to drink caffeinated coffee tomorrow before I start. I love most of my students, they are respectful, interested and although they share more with me than I sometimes want to know, I take that as a sign of trust. Yesterday I had a student tell her partner that she was a senior. I was surprised since most of my students are freshmen or sophomores. They all look so young that the difference between a freshman and a senior can be or is sometimes undetectable. After her 10 minutes I ask her why she was taking this class as a senior and hadn’t taken it sooner. She’s a great English speaker and a smart student. She told me she had taken the class before but was repeating it because she only got a B+ the first time around. The poster child for why we need to focus more on learning and less on grades. I continue to train for the TRI4ACURE Triathlon in Maine this summer. I’m up to a half-mile of slow breaststroke swimming. Good enough to get through that part of the race without hyperventilating. The women at the pool have stopped worrying about whether I’m showering properly and I move through my routine with a little less staring. Maybe I’ve just gotten used to it. I’m taking yoga with two colleagues, from New Zealand and England, who are at my yoga pace, and a wonderful teacher from the States. I bike the 30 minutes to the class, stopping at the pool on my way to swim and feeling very self-righteous all day long. When I accepted my teaching position it was made clear to me that there was a mandatory retirement age of 65 and there were few, if any, exceptions to that rule. I honestly didn’t give it much thought. Now that I love my life here and my job, I began wondering how this retirement would work. My contract is for one year ending in February of 2014, although I finish work in December of this year. I didn’t think I would be eligible for another year contract since I turn 65 on June 30 of 2014. That would only give me a half-year more to teach and the University works on a yearlong contract basis. Although I’m not sure what adventure will be next, I like the idea of having that decision rest with me and not a mandatory retirement age. I have begun to have conversations with my boss, who is very supportive and probably worries that he might lose Steve if he doesn’t keep me. Whatever the reason, I like the idea of options. The University hasn’t been faced with this dilemma before and once again I push the envelope to make change. It’s one thing to look my age; it’s another one entirely to act it. Stay in touch and I will too! When I arrived in Korea, more then a month ago, with an E-1 visa I was told I would need something called an Alien Registration Card. It all sounded pretty simple until I asked where and how I could obtain that coveted card. That’s when the Catch 22 began. I discovered that you couldn’t actually apply for an Alien Registration Card until you are officially employed and receive a letter of verification from the university. Kind of strange since you can’t get an E-1 visa unless you have a guaranteed job. I had about a week to wait for work to begin so in the meantime I thought I’d take care of some other things. I headed to the phone store to get a new sim card for my iPhone. I “simply” wanted to replace my AT&T sim card with an OLLEH sim card and pay the monthly fee for my new plan. That’s when I was asked for my Alien registration Card. Well, I don’t have one yet because I hadn’t started work. Sorry, no card, no phone. Once work began I received that letter saying I was in fact employed and Steve and I headed to immigration where I applied for my card. “Please sign here with both your English and Korean names,” said the lovely women waiting on me. MY KOREAN NAME? Was she serious? I have no idea what my name looks like in Korean. I know it’s pronounced MASHA GREENBERG. No “r”. It has a familiar ring. When Koreans pronounce my name they sound vaguely from Boston. But writing my name in Korean was a whole other thing. Luckily I had Steve with me and he stepped in for the Korean while I signed my name in English. I was told I would receive the card in 3 weeks. No problem, I thought. The next day the university informed me I needed to have a bank account so my first paycheck could be direct deposited. Since my first paycheck was scheduled to arrive before my Alien Registration Card I wondered how this would all work. No card, no bank account. However, since the university and the bank are somehow in cahoots, I received that same letter saying I was in fact employed. The bank opened an account for me that could only be used with permission from a bank employee until I had my Alien Registration Card, at which time I could get an ATM card and all would be wonderful. Three weeks passed and, sure enough, my card arrived with a picture that makes me look somewhere between a convict and an alien, the kind from outer space. I was so excited about getting my card, I raced over to the OLLEH phone store and proudly handed the clerk my new card along with my passport and my bankbook. I started feeling like a true alien, the travelling kind. The phone clerk started all the paper work and suddenly I saw a look come over his face. He explained to me that in order to have a phone, he needed to automatically withdraw the money from my bank account and somehow it wasn’t working. In my excitement I hadn’t gone back to the bank with my new Alien Registration Card. I gathered up all my paperwork and my phone and headed back to the bank to show them my newly printed card. The bank clerk drew up the necessary paperwork to make me official. “Sign here,” said the bank clerk, “Your Korean and English names.” He pointed to several places on the document requiring my Korean and English signatures. I starred at the man feeling an overwhelming sense of humility. The bank clerk pointed out my name in Korean on the document and I copied it over and over again signing my English name right along side while the bank clerk watched patiently. I completed all the necessary paperwork and left the bank with my freshly minted ATM card and my dose of humility and headed back to the phone store where I finally got my phone. I’m officially registered with the Korean government as an alien, one with a phone, a bank account and an ATM card. What more do I need?